Starbulletin.com publishes online editions Monday through Sunday. New editions normally posted online between 2:00 and 5:00 p.m.
selected articles of particular interest to our readers. 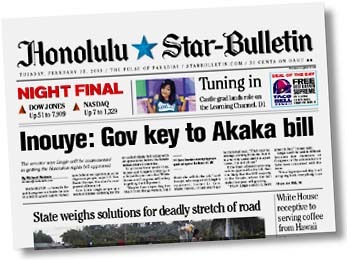 Honolulu Star-Bulletin. All rights reserved. See our display ads online! Click on sections of the ads to zoom in for a better look!